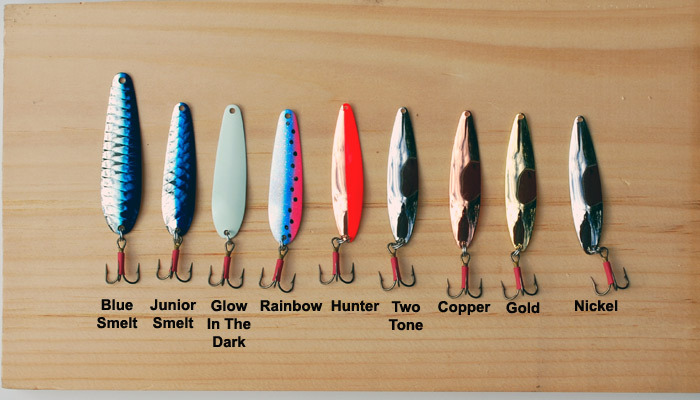 Here at Washington Lure & Bait we offer an assortment of proven fishing lures, "Spoons" for both Trolling and Casting. 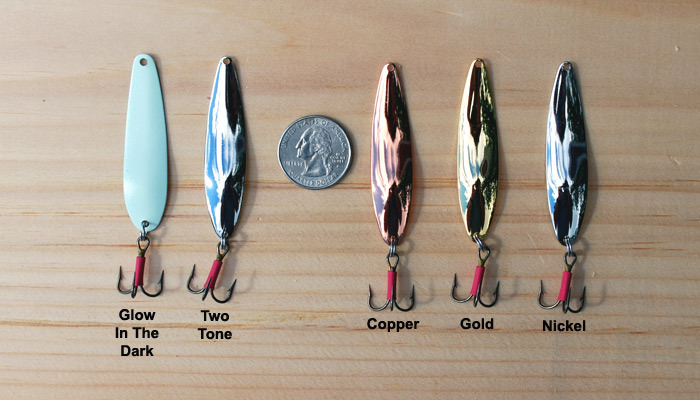 The Trolling Flutter spoons have consistently given good results fishing for Landlocked Salmon, Lake Trout, Rainbows and Brook Trout in the waters of New Hampshire and New England. 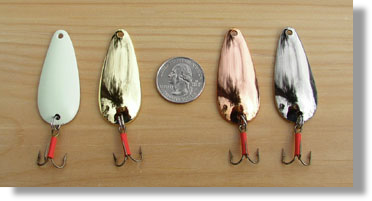 2 1/4” by 1/2”, it comes with size 6 treble hook. 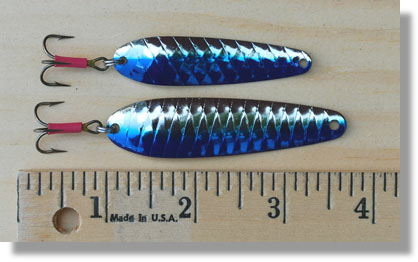 The original "Blue Smelt" Trolling Flutter Spoon is a Nickel lure with a transparent blue stripe. 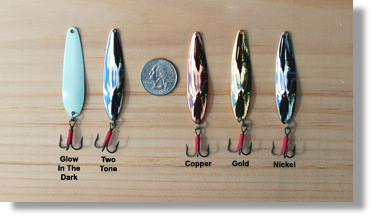 It measures 2 3/4" with out size 6 hook by 5/8" wide. 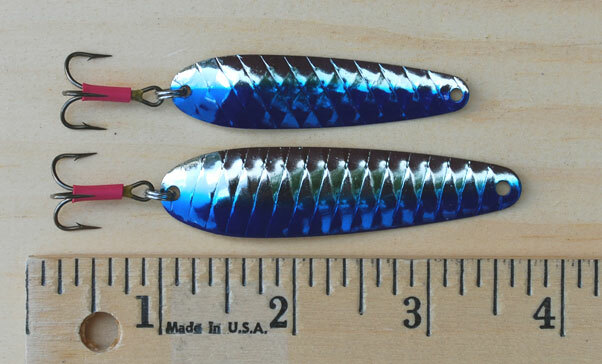 This lure also has a fish scale finish. We've fished both lures a lot over recent years and have had very good and consistent results with Lake Trout and Land Locked Salmon. 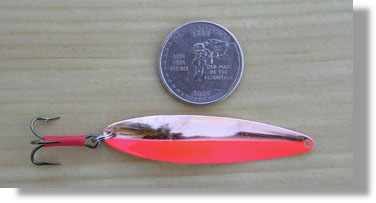 Another recent addition, we took a Copper Trolling Flutter Spoon and added a Florescent Red Stripe. We call this one "The Hunter". 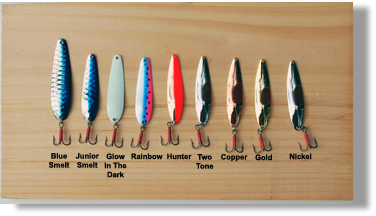 Not only has this lure done well with Lake Trout and Salmon, but also Rainbow Trout. This has shown to be another great performer. 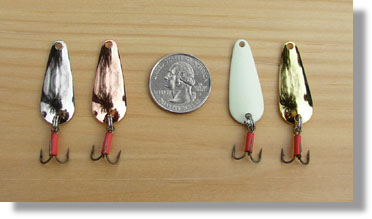 All our Copper Lures are coated to resist tarnish.